shall not be used for advertising or product endorsement purposes. 2010)  that 31 out of 35 investigated states in the U.S.
pounds. 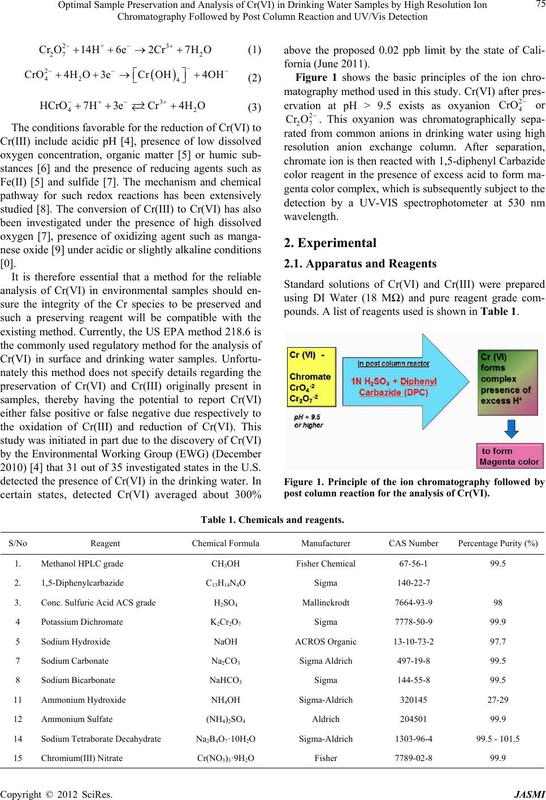 A list of reagents used is shown in Table 1.
post column reaction for the analysis of Cr(VI). Table 1. 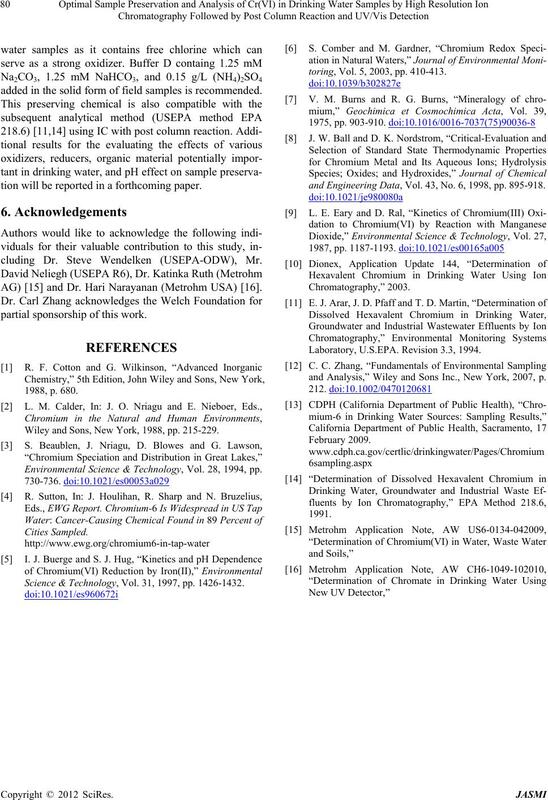 Chemicals and reagents. tions are given in Table 2.
sensitive solution was kept in dark prior to use. Table 2. 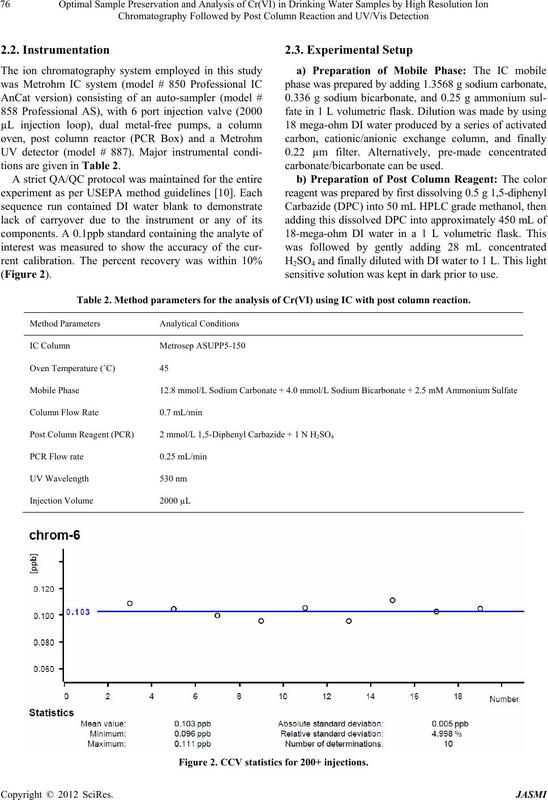 Method parameters for the analysis of Cr(VI) using IC with post column reaction. Figure 2. CCV statistics for 200+ injections. range as per Table 4. Figure 3. 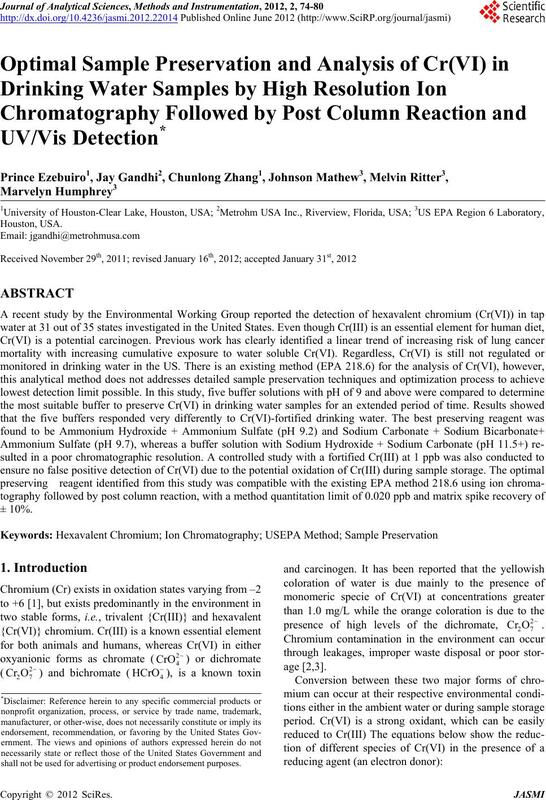 Cr(VI) at 0.025 ppb. the data for the study. the upper and lower recovery limits as shown below. The Upper PIR Limit must be 150 percent recovery. The Lower PIR Limit must be 50 percent recovery. Table 6 demonstrates analyzed data for MRL study. Table 5. 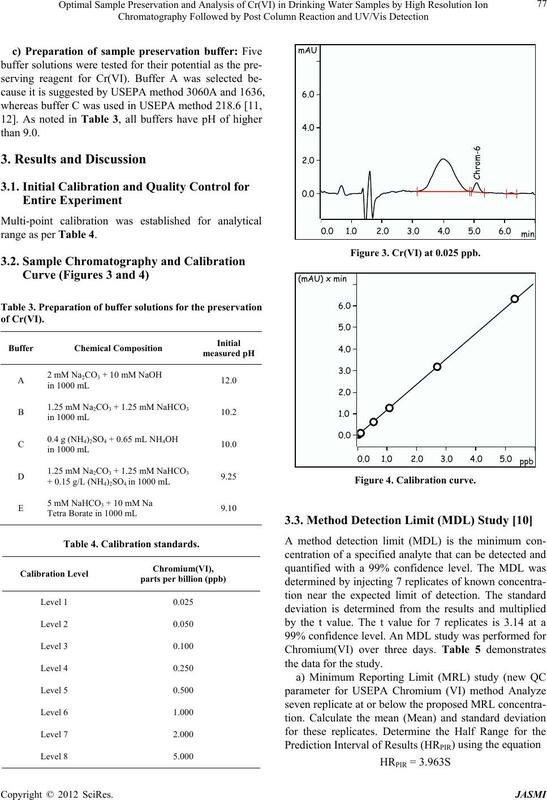 Method detection limit (MDL) study. Table 6. MRL study data. Chromium(VI) due to high pH of buffer (pH = 10.5). vert it to Cr(VI) very quickly. Figure 5. Buffer A data for Cr(III)--> Cr(VI) conversion. preserves Cr(VI) very well for at least 21 days. Figure 6. 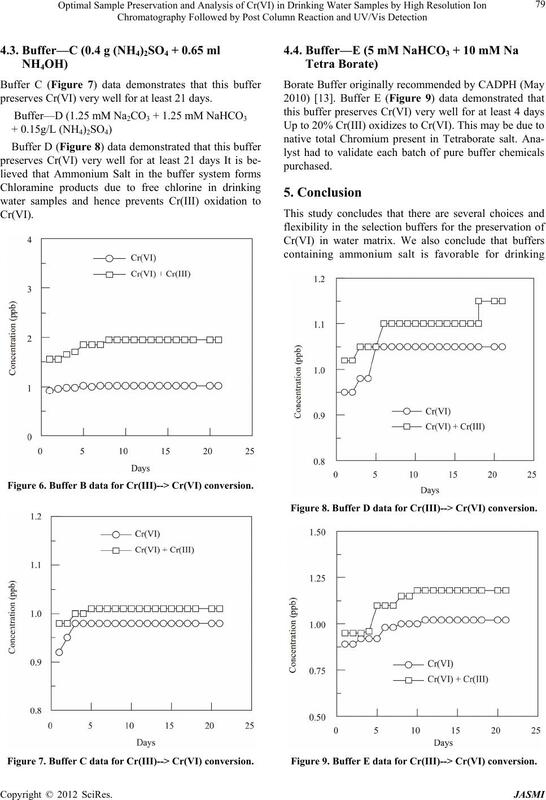 Buffer B data for Cr(III)--> Cr(VI) conversion. Figure 7. 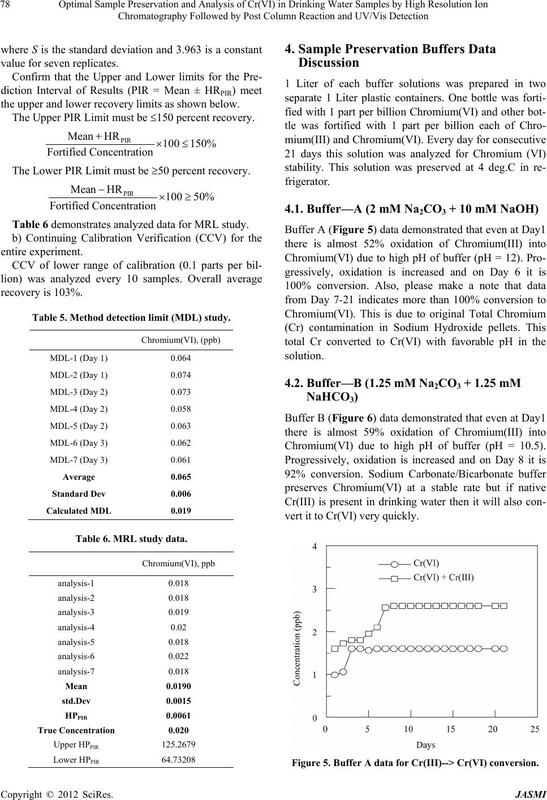 Buffer C data for Cr(III)--> Cr(VI) conversion. Figure 8. Buffer D data for Cr(III)--> Cr(VI) conversion. Figure 9. Buffer E data for Cr(III)--> Cr(VI) conversion. added in the solid form of field samples is recommended. tion will be reported in a forthcoming paper. cluding Dr. Steve Wendelken (USEPA-ODW), Mr.
AG)  and Dr. Hari Narayanan (Metrohm USA) . partial sponsorship of this work. Wiley and Sons, New York, 1988, pp. 215-229. Environmental Science & Technology, Vol. 28, 1994, pp. Science & Technology, Vol. 31, 1997, pp. 1426-1432.
toring, Vol. 5, 2003, pp. 410-413.
and Engineering Data, Vol. 43, No. 6, 1998, pp. 895-918. Laboratory, U.S.EPA. Revision 3.3, 1994.
and Analysis,” Wiley and Sons Inc., New York, 2007, p.